Check out a superb online play slots game from the team at NetEnt. 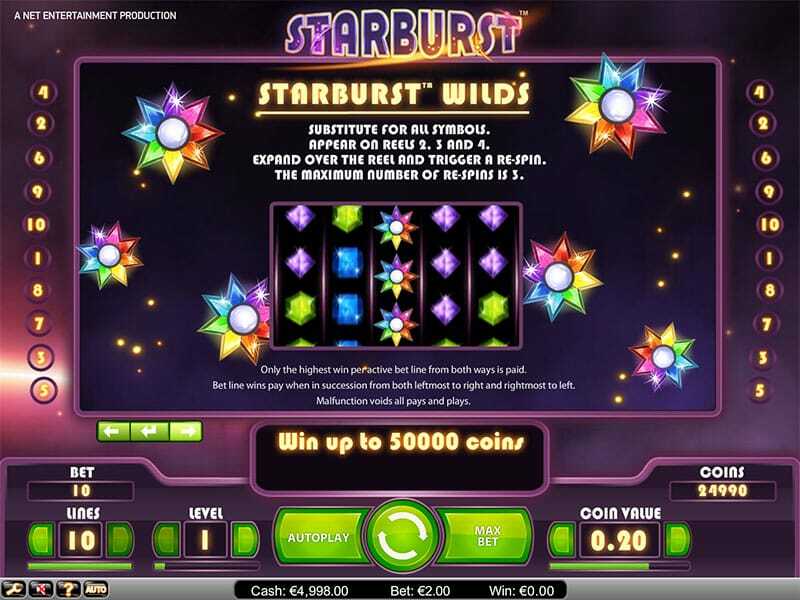 Blast off into a cosmic world of wins with Starburst, one of NetEnt’s most ‘out of this world’ slots experiences. Mankind is forever pushing the boundaries of our universe, travelling further and further into deep space, and discovering new worlds beyond our wildest imagination. Space travel conjures up the sense of possibility and wonder, and Starburst online slots game gives you a taste of this thrill. As James Tiberius Kirk says over the opening titles of Star Trek, space truly is the ‘final frontier’, and with Starburst, NetEnt takes us on a voyage of satisfying, classic gameplay and twinkling bonus features. Starburst game presented in a sleek and sturdy vessel made by a revered developer. 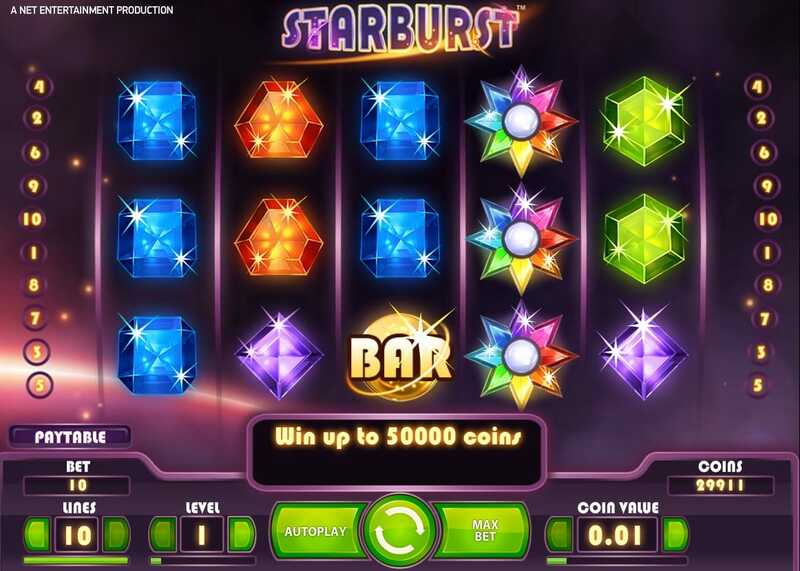 Also, Starburst Slots games have all the features to captivate fully-qualified slots-tronauts, but enough sparkle to entertain even the more casual slots stargazer, too. So, sit back, strap in, and get ready for the slots voyage of a lifetime! If you love promo's don't forget to visit Slotsbaby today. All these games, as well as this one, have cemented NetEnt’s reputation as one of the most vibrant and creative forces in online gaming. Theme and concept are central to every NetEnt game, as is world-building. A key feature in their games details, in their artwork, the intricacies and features of their gameplay, and user mechanics. NetEnt’s games often feature a quirky, incredibly detailed cartoon style, which gives their games an absorbing narrative, increasing the player’s feeling of investment in their world. They also often feature tone-perfect humour, with small details and animations to make you chuckle while you play, but never disrupt your slots experience. We’ve come to expect an immaculate level of quality from this team, and Starburst certainly doesn’t disappoint. 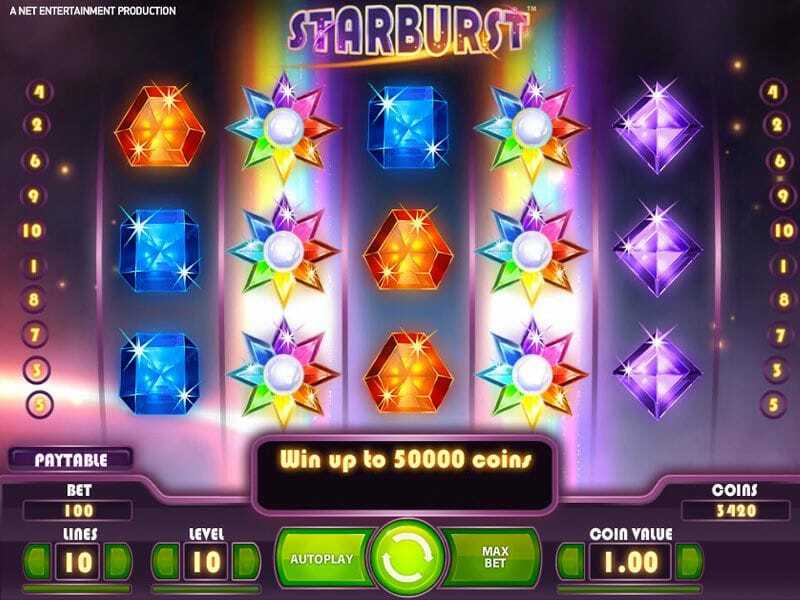 Though it isn’t opened by an animated cut-scene, the beauty of this game is in its elegant simplicity, Starburst slot can be enjoyed with HD graphics and it seems right that the player is launched straight into the action. It has all the hallmarks of a NetEnt offering, including stunning visuals, user-friendly controls, and captivating bonus features that will be sure to appease the mind, body, and soul. Prepare to be dazzled by the shimmering design, and a constellation of bonus features that keep its gameplay twinkling with vitality. The deep-space theme provides an immersive atmosphere and a dazzling visual experience, perfectly suited to an online slots package. The five reels float on a simple but effective backdrop of deep purple with drifting flecks of gold, giving the illusion of being suspended in deep space, and in the bottom left, the mysterious suggestion of a planet on the edge of your spaceship’s trajectory. The symbols in Starburst are bright and realistic-looking jewels (perhaps mined from exotic planets?) in an array of colours including purple, blue, green and orange, and each colour has a unique cut-gem shape. The red ‘7’ and gold ‘BAR’ symbols stand out in front of bright planets in Starbursts backdrop, encircled by Saturn-like rings, meaning they catch the eye, even amidst the brilliant jewels. The cosmic soundtrack is suitably mysterious and catchy, and the Star Trek-esque sound effects are fitting and entertaining. The surprising, triumphant ‘zap’ of a winning combo offers a great thrill. A lot of your time spent as a Starburst quest will be plain sailing, sitting back as exciting combos appear along win lines. But it gets truly exciting when the bonus features kick in. 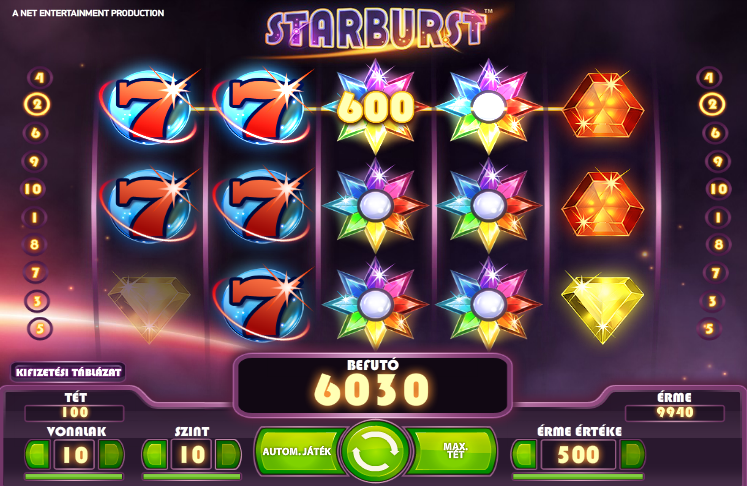 WILDS – Every so often, you will glimpse a spectacular rainbow-coloured star on Starburst slot reels 2, 3 and 4. This is the WILD symbol and can stand in for all other symbols. When it expands over the reel, it can trigger up to three re-spins. WIN BOTH WAYS – Whether your winning combination falls from left to right or right to left on the reels, you’ll receive the corresponding payout. This feature is deceptively simple but opens up a whole new world of winning possibilities on this slot. There’s a handy guide to all of the paylines in the menu, too, so your mind isn’t boggled by the many ways to win. SKILL STOP – A feature that will appeal to players who like to keep tight control over their game, skill stop allows you to simply click the mouse to manually stop the reels. Of course, the outcome of the spin is still random, but this gives the feeling that Starburst is truly yours. Indeed, this game is unbelievably versatile, with a dazzling level of player-control. You take the helm of this Starburst spaceship, as you choose the number of lines, your overall level, and your bet amount. The autoplay feature, too, much like an ‘autopilot’ function on a spaceship, is easily customizable, allowing you to choose a set number of rounds from 10 to 75, and then sit back and watch the wins roll in. Simply hover over any symbol, and like magic, information will appear about its unique qualities and enter the menu section for quick information on win lines and bonus features. Try Starburst Online Slot for yourself Today! Starburst is a true space odyssey of a game. It provides a classic slots experience in a futuristic package, delivering consistently in entertainment-value, player satisfaction and interactivity. Winning opportunities are plentiful, and the simple but effective features make for thrills that keep the game varied and moving along at pace. This is a smooth and satisfying game to pilot, and its customisation features allow the player to take it for any type of spin they fancy. This is a star-studded slots package, bursting with thrills, and a delight to dip into for a short game, or put through its paces for a more committed slots session. If you enjoyed Starburst then you might also like Fluffy Favourites.